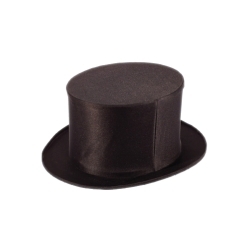 Black Folding Top Hat - Perfect for Magicians! Black collapsible top hat with a silk like finish. This top hat is designed to pop-up and then collapse back down. The black collapsible top hat fits up to a 22 1/2" head measurement. The black collapsible top hat pops open with a flashy flourish and a loud snap adding a unique finishing touch to a tuxedo costume. This hat can also be used magicians, adding a little flair to their performance. Please note: The collapsible folding top hat will need to be open and closed a few times before it will snap open.